Can Practicing Tai Chi Improve Your Balance? As you get older, taking up the ancient practice known as tai chi may help improve your balance. Often referred to as a form of “moving meditation,” tai chi has been found to enhance stability and prevent falls in many scientific studies. Long used in traditional Chinese medicine, tai chi is a mind-body technique that involves carrying out a series of slow, gentle movements. Often hailed for its stress-relieving effects, tai chi combines these movements with deep breathing and meditation. Tai chi is also regarded as a martial art. To that end, tai chi movements can be used in combat or self-defense when performed with speed and power. Not only used to improve balance, tai chi may help manage a wide range of chronic health troubles. For instance, research shows that practicing tai chi may help ease the pain associated with conditions like arthritis, chronic low back pain, and fibromyalgia. Some studies also suggest that tai chi can stimulate the immune system, as well as boost quality of life in people with major diseases like cancer and heart disease. In addition, tai chi may help alleviate mental health issues such as anxiety. Why Is Tai Chi Used to Improve Balance? For many people, advanced age is accompanied by a decrease in postural stability (i.e., the ability to maintain the position of your body within a certain spatial zone). Balance function typically begins to decline in middle age, with risk of falls and injuries gradually increasing over time. Exercise is often recommended as an everyday approach to improving balance and reducing risk of falls. Along with tai chi, yoga is often touted for its possible balance-boosting benefits. There are several reasons why tai chi is considered helpful in improving balance. The practice is thought to affect a number of factors involved in maintaining postural stability, including flexibility, strength, and range of motion. It’s also said that tai chi can help prevent falls by enhancing your spatial awareness. The Research on Tai Chi for Balance: Can It Help? Although there’s currently a lack of large-scale studies exploring tai chi’s health effects, a growing body of research shows that tai chi may be beneficial when it comes to improving balance. For a report appearing in the Journal of Geriatric Physical Therapy in 2010, scientists looked at 19 previously published studies testing the effects of tai chi on balance function in adults ages 60 and older. Most of the reviewed studies involved tai chi sessions that lasted at least 45 minutes and took place at least twice a week for a duration of 12 weeks or longer. In their analysis, the report’s authors found that tai chi improved such factors as flexibility, rate of falling, range of motion, and joint strength. The report concluded that tai chi may be “an economic and effective exercise program for improving balance and balance confidence in older adults.” However, the report’s authors noted that “vigorous” study members seemed to benefit more from tai chi (compared to frail participants). 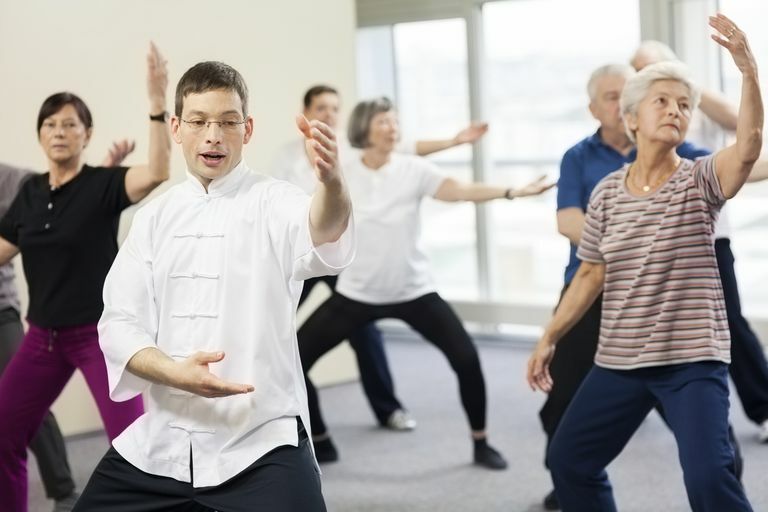 There’s also some evidence that tai chi may help improve balance in people with Parkinson’s disease, a movement disorder that leads to balance impairment. This evidence includes a report published in the journal PLoS One in 2014. While it’s possible to learn tai chi from books or audio/video resources, taking a class or working with a tai chi instructor helps ensure that you’re performing the movements correctly. Tai chi is generally considered safe, but it may cause minor aches and pains in some individuals. People with health problems and women who are pregnant should consult their health care providers prior to practicing tai chi. If you’re thinking of using tai chi to improve your balance, keep in mind that a number of health and lifestyle factors can influence your risk of falling as you age. For example, issues such as muscle weakness, problems with blood pressure control, and use of certain medications can all impact your balance. To stay safe, talk to your doctor if you’re having any trouble with balance, and ask if tai chi might be helpful for you. Leung DP, Chan CK, Tsang HW, Tsang WW, Jones AY. Tai Chi as an Intervention to Improve Balance and Reduce Falls in Older Adults: A Systematic and Meta-Analytical Review. Altern Ther Health Med. 2011 Jan-Feb;17(1):40-8. Liu H, Frank A. Tai chi as a Balance Improvement Exercise for Older Adults: A Systematic Review. J Geriatr Phys Ther. 2010 Jul-Sep;33(3):103-9. Maciaszek J1, Osiński W. The Effects of Tai Chi on Body Balance in Elderly People--A Review of Studies From the Early 21st Century. Am J Chin Med. 2010;38(2):219-29. Ni M, Mooney K, Richards L, et al. Comparative Impacts of Tai Chi, Balance Training, and a Specially-Designed Yoga Program on Balance in Older Fallers. Arch Phys Med Rehabil. 2014 Sep;95(9):1620-1628.e30. Ni X, Liu S, Lu F, Shi X, Guo X. Efficacy and Safety of Tai Chi for Parkinson's Disease: A Systematic Review and Meta-Analysis of Randomized Controlled Trials. PLoS One. 2014 Jun 13;9(6):e99377.